Background: Ultrasound has been widely used in clinical diagnosis because it is noninvasive, inexpensive, simple, and reproducible. With the development of molecular imaging, material science, and ultrasound contrast agents, ultrasound-targeted delivery technology has emerged. The interaction of ultrasound and molecular probes can be exploited to change the structures of cells and tissues in order to promote the targeted release of therapeutic substances to local tumors. The targeted delivery of drugs, genes, and gases would not only improve the efficacy of tumor treatment but also avoid the systemic toxicity and side effects caused by antitumor treatments. This technology was recently applied in clinical trials and showed enormous potential for clinical application. Objective: This article briefly introduces the characteristics of the tumor microenvironment and the principle of ultrasound-targeted delivery technology. 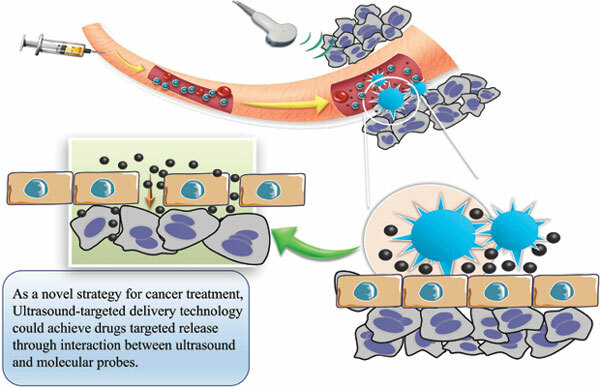 To present recent progress in this field, this review focuses on the application of ultrasound-targeted delivery technology in tumor-targeted therapy, including drug delivery, gene transfection, and gas treatment. Results: The results of this study show that ultrasound-targeted delivery technology is a promising therapeutic strategy for tumor treatment. Conclusion: Ultrasound-targeted delivery technology shows promise with regard to cancer treatment. Drug delivery, targeted therapy, ultrasound, tumor, microbubble, gene therapy, gas treatment.